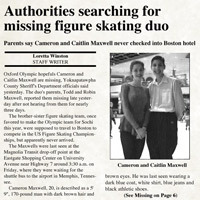 This clip of the missing skaters comes from an interview Cameron and Caitlin Maxwell did with the SportsTime News in Atlanta. The YCSD seeks the public's help to find Cameron and Caitlin Maxwell. 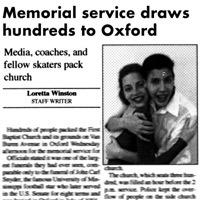 Last month, the local newspaper covered Cameron and Caitlin Maxwell's return to Oxford after training out of town. Cameron and Caitlin Maxwell were laid to rest in a well-attended memorial service.